PulsePoint’s content marketing platform allows you to manage, distribute & optimize your content across premium publishers in one interface through 25+ social, native and content discovery distribution partners. Join customers like Reebok, Turkish Airlines, Columbia & others, who are promoting their content with us. Request a demo today. - Reach the right eyeballs. Our proprietary contextual & audience targeting technology gets you in front of your ideal audience across multiple content channels. - Smart bidding solution. Our proprietary technology ensures you get the most efficient bids and cost per engagement while growing volume. - Report & optimize in one place. Get consolidated reporting. 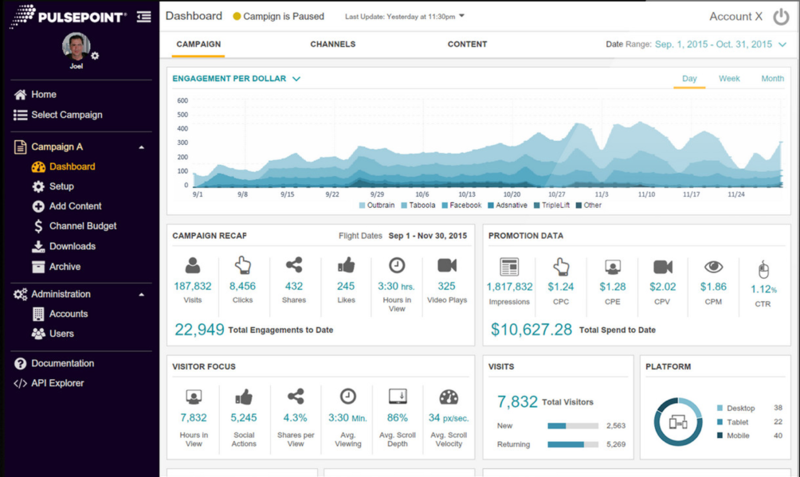 Plus, the platform will monitor and A/B test your campaign content and formats to maximize engagement. CPx- based pricing, you only pay for results. In a world where traditional marketing is losing its ability to drive results, content marketing has emerged as the best way to drive profitable customer action. Publishing quality content to targeted audiences is a proven way to get results. But the complexity and cost of dealing with multiple publishing partners can limit your reach. Finding a service that can handle this complexity for you becomes a priority as you scale up. PulsePoint®, Inc. is a programmatic ad company that originated in the merger of ContextWeb and Datran Media. Their content marketing platform implements a Programmatic Ad Exchange. It is designed to boost your ROI by handling the technical complexity of high-volume, targeted content marketing for you. In this review we'll look at PulsePoint's solution to see how it benefits both high-volume content marketers and the publishers they rely on. When you work with PulsePoint, you begin by generating quality content that you want delivered to a targeted audience. This is the first step in any content marketing approach and is in some ways the easiest. Content marketers usually find it harder to get content to the target audience than it is to generate the content in the first place. PulsePoint works with a large number of publishing partners to give you access to quality, targetable audiences. You have full control over this process, as you get to specify the partners you want to work with. You can also specify the audience segment you want to hit through that publishing partner. The PulsePoint content marketing platform handles all the details in the background. Perhaps surprisingly, PulsePoint doesn't actually post your content to the partner sites. Instead, the system automatically creates small ads built around the first image in your content and the title. Getting a potential customer to read your content is valuable. Getting a potential customer to read your content on your own website is even more valuable. The PulsePoint approach uses small ads to entice people to click through to your website so they can read the entire story. However, getting the right people to come to your site to view your content isn't enough in itself. You want the maximum return on your investment. This means you need to run a lot of split tests. PulsePoint automates that process for you too. You feed the system additional images and alternate titles. It in turn generates and tracks the split tests, optimizing results automatically. But what results is the platform optimizing? There are actually two levels of optimization possible here. Remember that PulsePoint allows you to run your ads on multiple publishing partner sites. So one level of optimization is standard A/B split testing on ad images and titles. The second level is optimizing on the publisher level. That is, which publishers are delivering the best results. This is where the PulsePoint platform really shines. Imagine that you are working with one publisher, and have one ad. This one ad has two images and two headlines. This gives you 4 combinations to split test. That's not too tough. The amount of data is reasonable and there aren't too many variables. Now imagine that you have the same ad setup but with two publishers. Now you have to test the performance of each ad at each partner. After all, the combination of image and headline that works best at Publisher A isn't guaranteed to work best at Publisher B. But if you really want the best ROI, you also have to track which publisher is delivering the best results. Doubling the number of partners more than doubles the amount of numbers you need to crunch but it is still manageable. For small, simple campaigns you don't really need the help of someone like PulsePoint. But if you are looking at higher volumes, things can quickly get out of hand. Imagine now that you want to run 3 ads at each of 5 publishers. Furthermore, Ad #1 has 3 images and 3 possible headlines, #2 has two of each, and #3 has 1 image and 3 headlines. How do you figure out which combination of ad variations and publishers is giving you the best results? There will be a huge amount of data to crunch. And even if you have do you have all the data, do you have any idea how to do the math for a problem like this? I certainly don't. The PulsePoint content marketing platform can handle problems like this for you with no trouble. PulsePoint also handles the relationships with all the partners, so you don't have to negotiate a deal every time you want to add a new partner. If you want to do large volume content marketing campaigns, these guys can make your life immensely easier. That's the big picture for PulsePoint from the Advertiser perspective. If you are a Publisher, PulsePoint offers, "a comprehensive and flexible platform built to simplify programmatic selling for maximum revenue and inventory insights." Using their technology, including their programmatic ad exchange, you should see better results from the ads that appear next to your content. Now let's look at some of the technology behind the scenes. PulsePoint incorporates a lot of technology into their platform to help you get the best results possible. We'll look at the technology for advertisers first, then for publishers. Contextualization – By analyzing the pages of tens of thousands of publishers they can ensure that your ads appear next to appropriate quality publisher content. Sentiment Analysis (a.k.a. opinion mining) – The system analyzes the text of content on publisher pages to ensure that your ads don't appear next to content that is negative toward your brand. Viewability – There's no point in running ads that people won't ever see. PulsePoint detects where your ad appears (above or below the fold) and determines whether viewers actually see the ad. Contextualization – You don't want bad or irrelevant ads to appear next to the content you publish. PulsePoint analyzes your content to display the most relevant ads on your pages. Sentiment Analysis – This type of analysis helps ensure that ads are not only in context with your content, but actually make sense for that content. For example, you wouldn't want an ad for synthetic steroids to appear on a page discussing the benefits of natural bodybuilding. Note: In addition to contextualization and sentiment analysis, PulsePoint is making a big move into Header Bidding. To learn more, download their Header Bidding Manifesto. PulsePoint's Programmatic Ad Exchange helps advertisers scale up your business. It provides access to billions of ad impressions that appear in over 200 countries. Ad formats can include display, mobile web, in-app, native, and video. You also have fine control over where your ads can appear, as well as the benefits of the technologies we just discussed. The system delivers in-depth reporting too. It tracks a wide range of KPI's, including detailed post-click behavior. You'll be able to make smart data-driven decisions that maximize the returns you achieve from your ads. If you are a Publisher, PulsePoint's unified ad tech stacks can deliver up to 24% higher CPMs. You believe that content marketing is the way to reach your audience. You believe in investing to get your content delivered to the right audience. You believe in large-scale marketing using many partners to get the best results. Read more about PulsePoint on DiscoverCloud.